Hotel Stripes an Autograph Collection Hotel by Marriott. 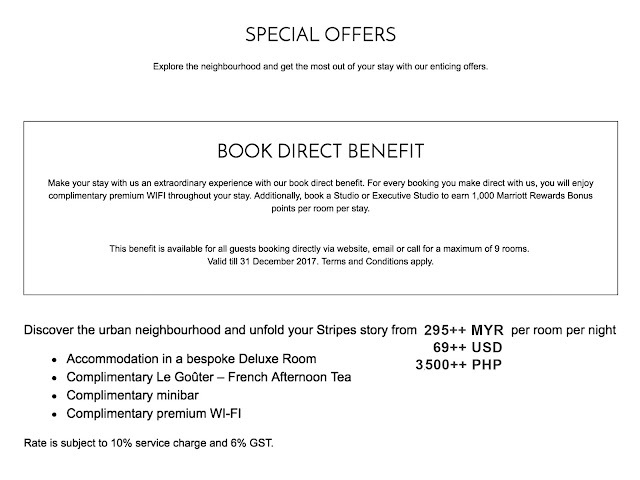 Hotel Stripes welcomes everyone to experience the urban neighbourhood of Jalan Kamunting in downtown Kuala Lumpur. 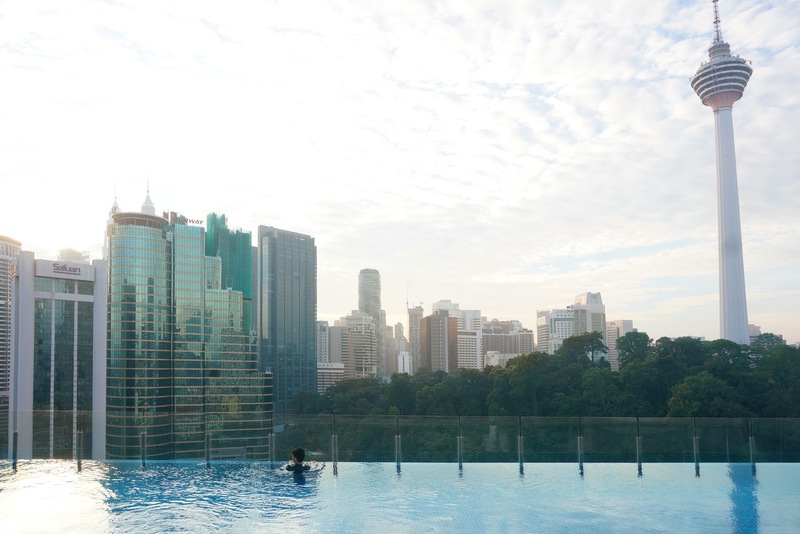 The property has a total of 184 rooms arranged across 21 floors, 2 restaurants, and a rooftop bar serving the outdoor infinity pool. 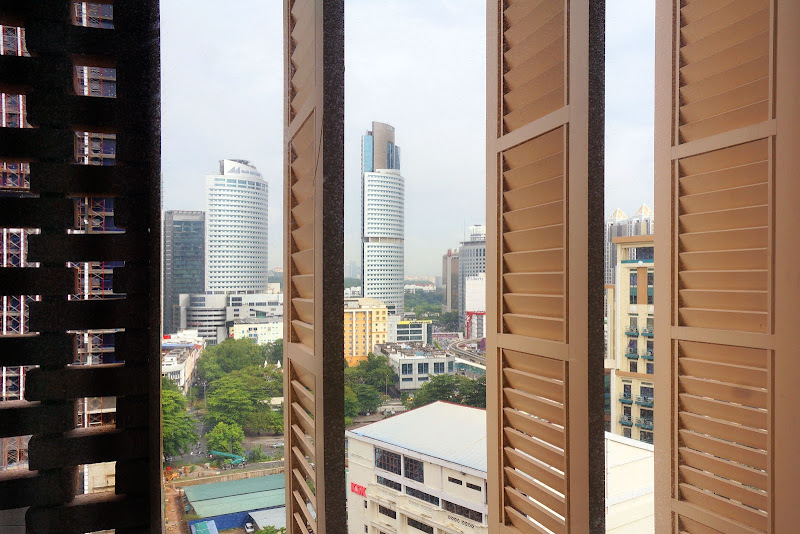 The distinctive brick-lined facade along with the vertical wooden louvres and colonial white base of the building really gives the hotel its unique character. 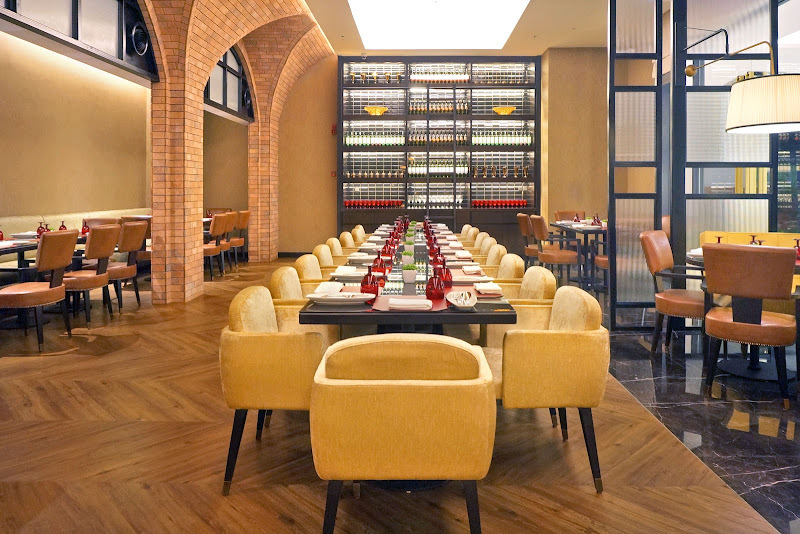 Brasserie 25 exudes a rustic charm. 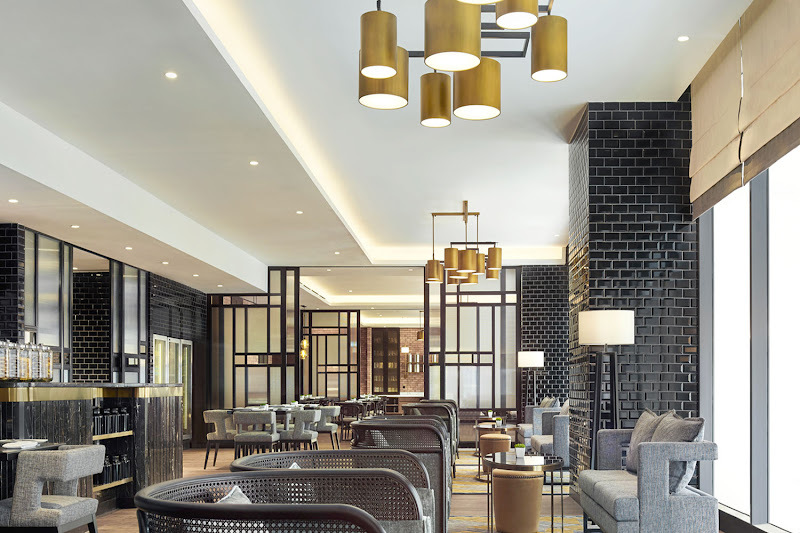 With its red brick arcades, mid-century copper sputnik chandeliers and dark wood floors, this French-style restaurant located on level 1 provides a dramatic yet relaxed vibe. Read more…. The Snug is the breakfast venue for guests staying at Hotel Stripes. The Layout is parallel to the road which gives it optimal daylight. Tables are spaced well apart and some table setups with couches allow guests to lounge during breakfast. The wide assortment of fresh juices alone already suffices make their buffet rate a good deal. The hot dishes may not be as extensive, but at least they change the menu items daily. The pastry basket is filled with the usual croissant, peach and strawberry danishes, and various breads for sandwich making. Cereal selection has the popular basics. The egg station at the Buffet nook tends to get busy, but don’t worry about waiting as they will always offer to deliver. 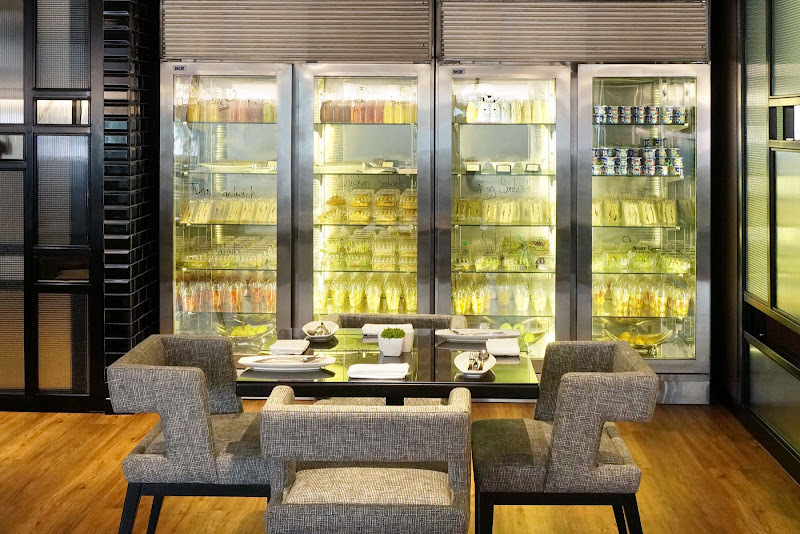 The row of fridges filled with freshly squeezed bottled juices, cold sandwiches, cheeses, yogurts and various fruits. The overall breakfast experience is worth having even daily, we visited all 5 mornings during our stay and the consistency of the service and food quality is commendable. The location of hotel stripes isn’t central for breakfast joints, which is why we didn’t bother eating breakfast elsewhere. Our room rate included breakfast and we didn’t expect it to be as good as we had. 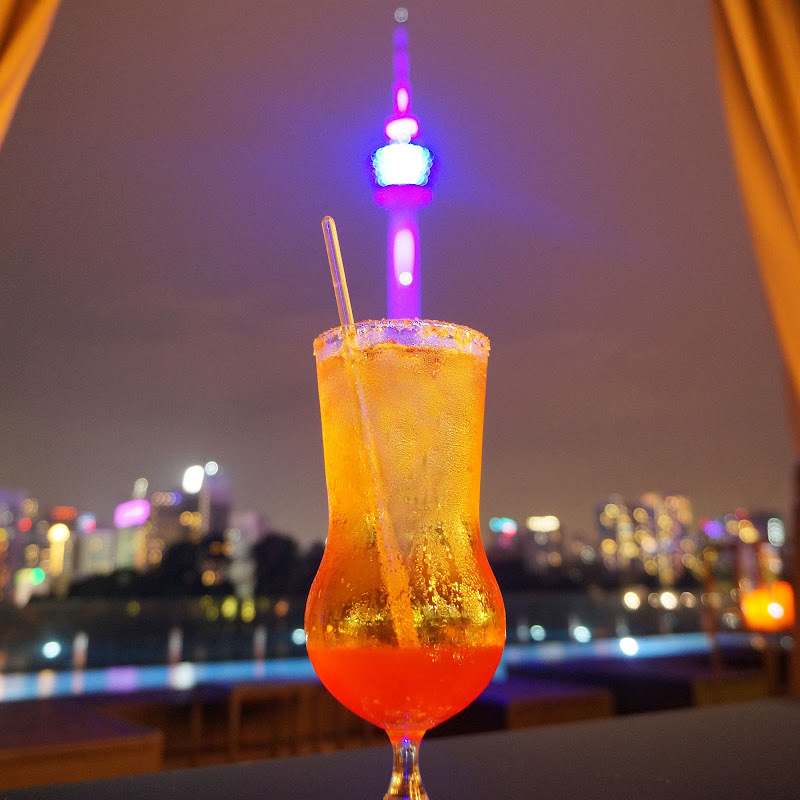 The Man Tao Bar is located by the infinity pool on the roof deck that overlooks the KL Tower complex and the Kuala Lumpur City Center. We arrived stripes in the evening and being hungry we immediately had dinner at Brasserie 25, which was worth the premium. Afterward, we had to top off our night somewhere, but we couldn’t venture off anywhere as we forgot to change currency at the airport. 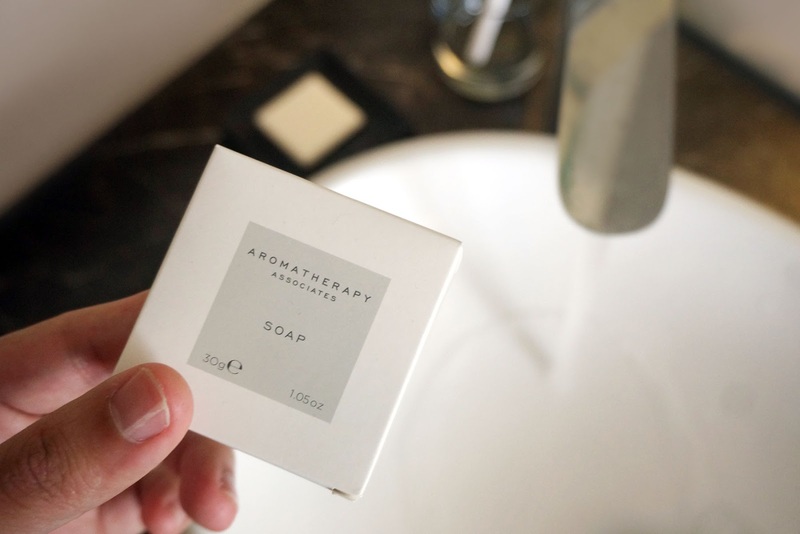 The hotel does offer money exchange, but we suggest doing it at a mall for better value. We recommend NS Cash Point at Suria KLCC Mall, enter from the Louis Vuitton side, take the first escalator from the door down and make a u-turn, walk straight and it will be on your left. They’re open from 10 AM to 10PM Daily. Back to Man Tao Bar, we decided on a couple of drinks and took the table by the pool. The 30 square meter Deluxe Room maybe smaller than most 5-star hotels in the Kuala Lumpur, but sometimes space isn’t everything. 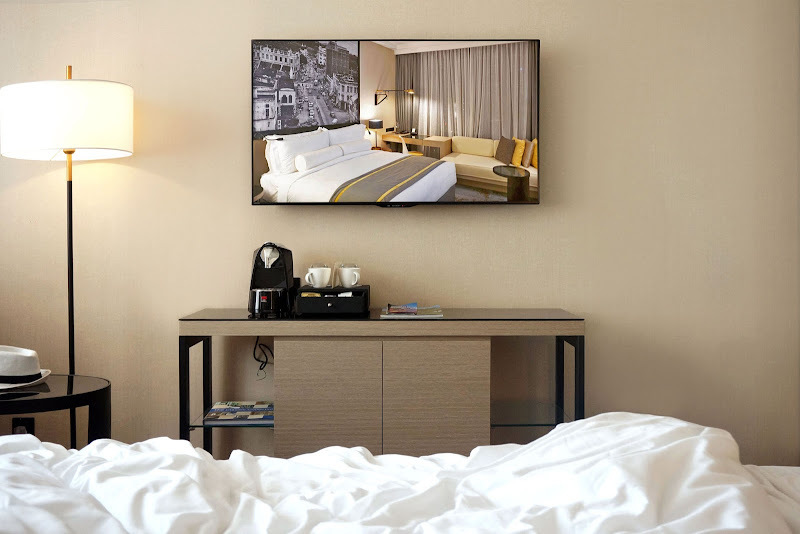 The room layout is functional and for most travellers it’s more than enough to relax after a long day of exploring the city. The unique features such as the wide sofa bed that accommodates another adult comfortably. 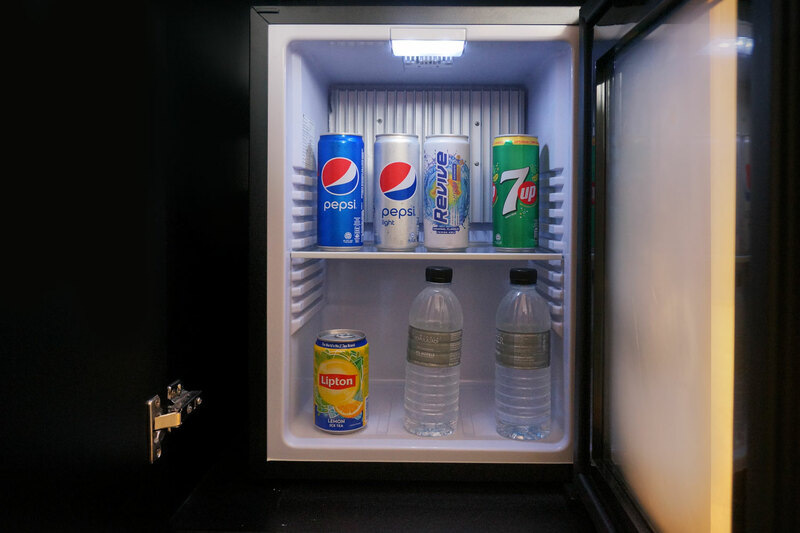 When booking direct through the Hotel Stripes website you get the mini-bar complimentary that’s restocked daily. We didn’t avail of it early on as we embarrassingly couldn’t find the fridge. It’s hidden behind the vertical mirror by the right side of the Television. 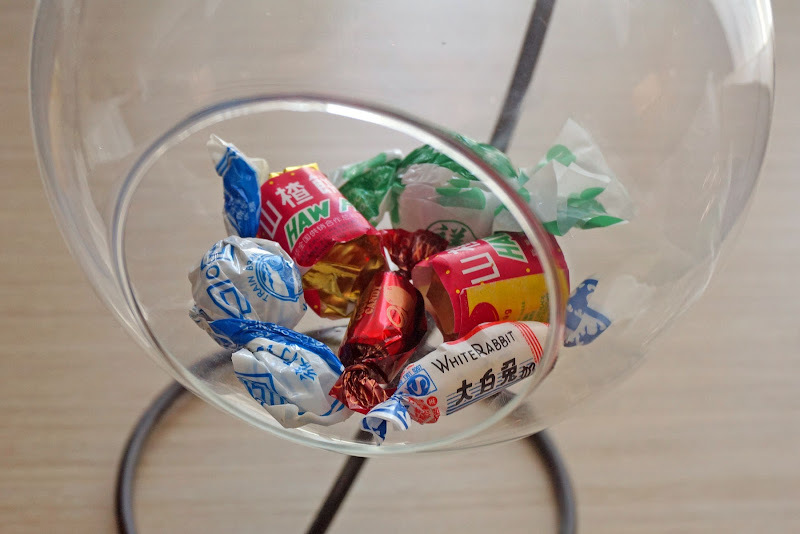 The welcome amenity are these old-fashioned sweets popular in Malaysia in the 80’s and I’m familiar with the White Rabbit cream candy as it was also popular treat back then in the Philippines. 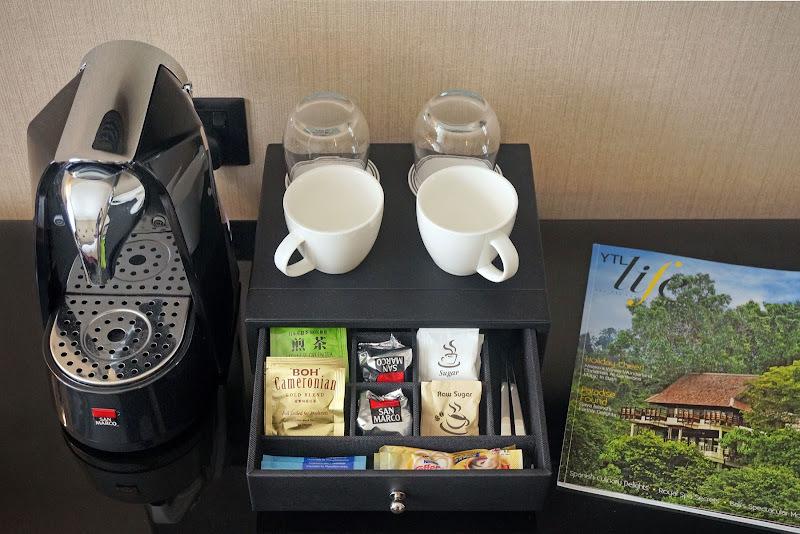 The Coffee and Tea amenity is stocked with Black Teas from BOH Plantation – local Malaysian tea manufacturer and refreshing Japanese Green Teas from OSK Japan, while coffee is provided by the San Marco Capsule System with 100% Arabica blends. Interestingly, Radisson Blu Plaza Hotel in Sydney uses the very same machine. The unique facade of red bricks does impede on the view of the floor to ceiling windows with some rooms limited vertical openings from the decorative doors and holes from the interweaved red bricks. Despite the obstructions the room is still easily filled with natural light, besides the view from the roof deck is much more pleasant especially during sunrise as the sunlight filters through the tall buildings. 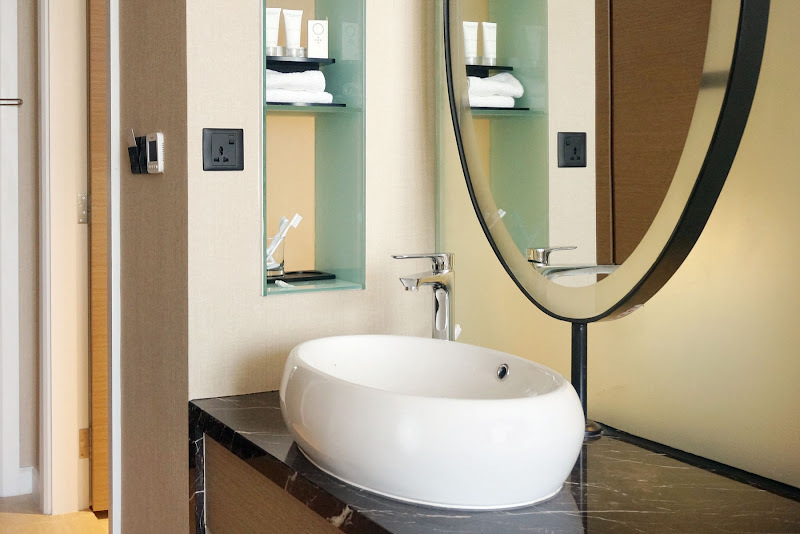 The bathroom layout is out odd yet practical with the sink in the bedroom area effectively allowing more space in the bathroom and to think about utilising the unused hallway space is ingenious plus the daylight from windows make it easier to groom. 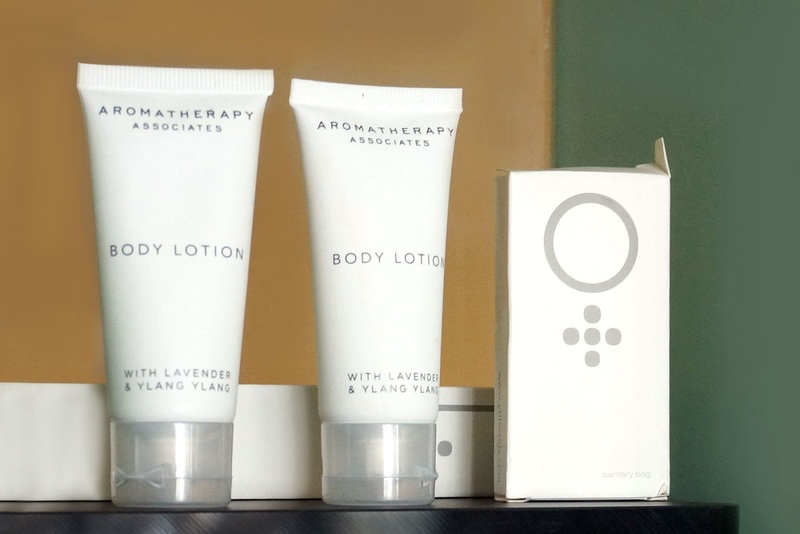 Bathroom amenities are a mix of brands with Shampoo and Conditioner provided by Mangosteen in pump bottles affixed to the shower wall and Aromatherapy Associates for soaps and body lotion. 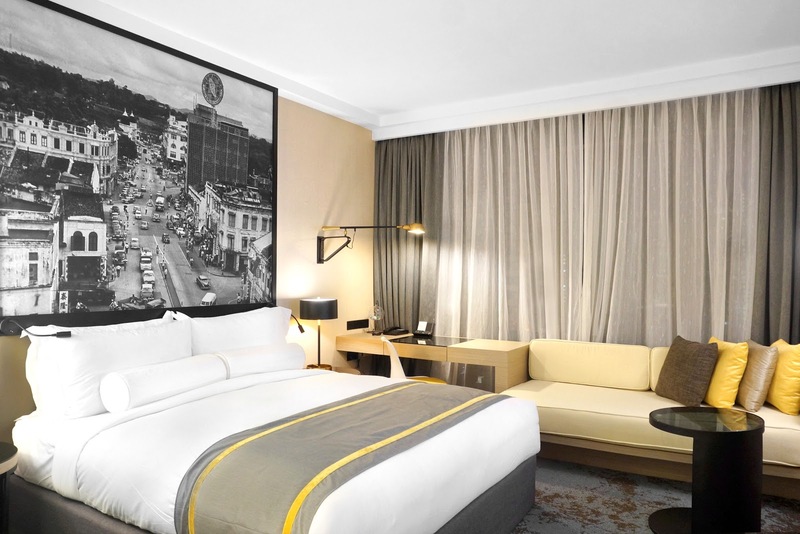 Hotel Stripes is a good balance of luxury and location with amenities that’s ideal for both business travellers and leisure guests seeking a quiet hotel in the heart of Kuala Lumpur. The Gym is well equipped state of the art machines with the latest built-in entertainment system. The Pool on the rooftop is unheated is suited for lounging rather than laps as 15 meters maybe too short for some. The WiFi during our stay was unstable and tops out at 3 mbps which is alright for browsing and social media. Business travellers may need to avail of the premium internet package. The Location is on the quiet neighbourhood of Jalan Kamunting, Chow Kit with shops and dining limited to boutiques and cafes. The nearest mall would be Quill City Mall, but is inaccessible by foot unless you pay the fee to cross the Medan Tuanku Monorail Station. We recommend taking GrabCar to Suria KLCC or any mall to Bukit Bintang. Ask the reception if they still offer the complimentary shuttle service to JW Marriott in Bukit Bintang as the property is also managed by YTL Hotels. I remember them offering it until 8 PM daily. 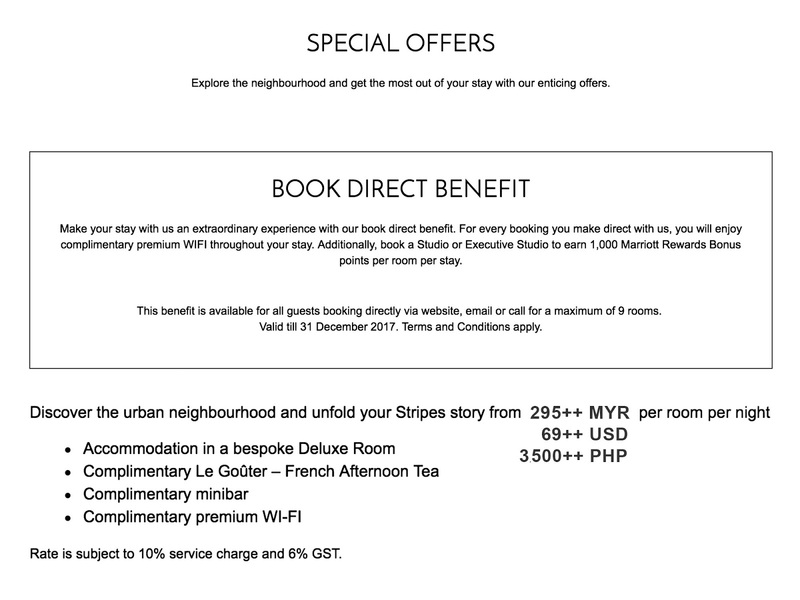 The Price you pay for at Hotel Stripes in our opinion the best deal you can get in Kuala Lumpur. A brand new hotel built-in 2017 branded under Autograph Collection by Marriott. The People at Hotel Stripes are young and eager to please. The doorman always greets you with a smile and genuinely welcomes you every time you pass through the door. Looking forward to revisit even for just the lamb chops at Brasserie 25.